Make wine-must rolls as follows: moisten a bushel of wheat flour with wine-must, add aniseed, cumin, two pounds of suet, a pound of cheese and some grated bay twig; after you have shaped them, place them on bay leaves and bake. baker's certificate" or perhaps a recipe. His wife is holding a stylus for writing and a wax tablet. Perhaps it signifies that she does the books for the bakery, perhaps she is proud of her literacy. The picture was probably intended to advertise the couple's success to future generations. where he was chained up. 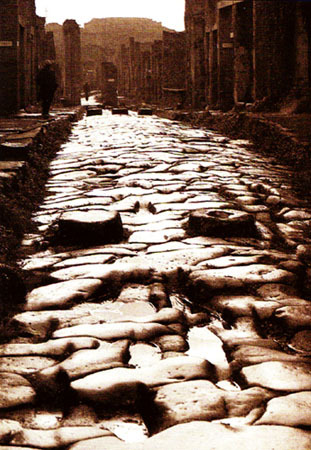 Pompeii was lost under a mountain of ash within a few hours; only a handful of people escaped. Plinv the Younger (с 61—c.113) witnessed the inferno from the Bay of Naples as an eighteen-year-old. He wrote that, of the people in the area, "most prayed to the gods. Others, however, explained that there were no more gods anywhere; the last night on earth had plunged the world in eternal darkness". 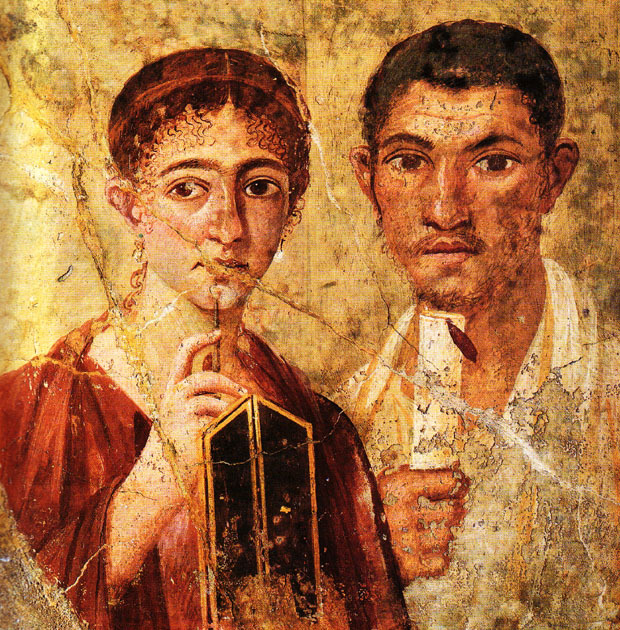 There was no question of rebuilding Pompeii, the ash hardened into rock and it was not until 1748 that the rediscovered ruins — especially some well-preserved interior frescoes — created a sensation throughout Europe. Along with neighbouring Herculaneum, which suffered the same fate, Pompeii provides us with incomparable evidence of what daily life was like in ancient Rome.